A multicultural cast of children imagines what it would be like to be president. Start reading If I Were President on your Kindle in under a minute. "A simple explanation of the diverse duties of the president of the United States." "The loosely rendered illustrations match the informal, informative text." A multicultural cast of children imagines what is would be like to be president. 5.0 out of 5 starsGood Little Book for Children. Great little book to share with children for this election year. It explains the basics on how we elect our present and what the president does in language kids can understand. Goodness know they can't watch TV on this subject, this time around. Great book to use with Interactive Read Alouds in our school district that matches our Social Studies Standards in TN. 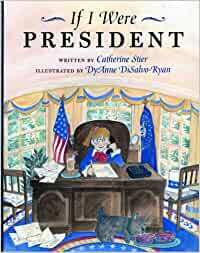 This book is written from a child's prespective.... if I were the President I would... It goes through the main duties of a president in an interesting, clear way accomapnied with nice illustrations. I loved that it explained in simple terms that the President does what he things is best (with help of cabinet..), but not everyone agrees. What a great first introduction for 4-8 year olds! Gives a good overview of some of the duties of a president. I like how many children are portrayed as the kid president to reinforce that anybody can become president.